Everything Beauty and Beyond! : Blank Canvas Cosmetics 15 Piece Professional Brush Set! 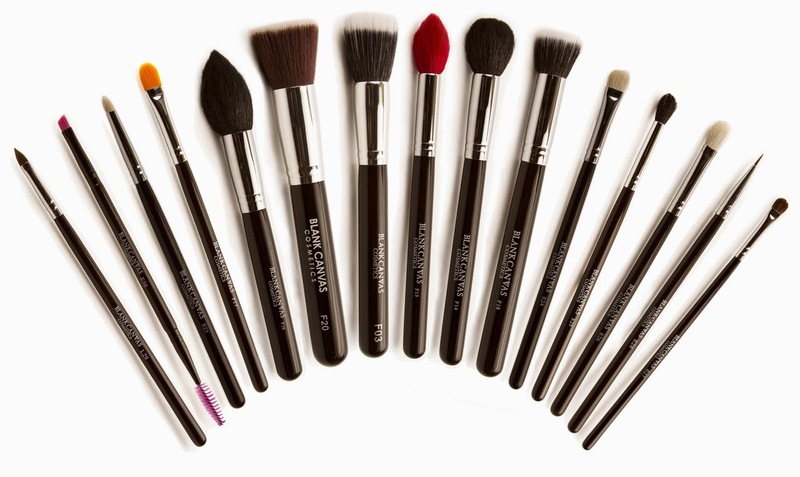 Blank Canvas Cosmetics 15 Piece Professional Brush Set! Makeup is like art. You need the right tools to draw on your canvas in order to make and create that perfect picture. Nonetheless, tools are very important to use, in order to achieve this result. An artist can always use their hands to draw their inspiration, however its hard to achieve those fine lines without the proper tools. When I really got into makeup last year at the age of 32, I realized that if I wanted to look my age, look professional and not like Krusty The Clown, then I would not only need the right colors and foundation to compliment my face, but I would also need the right brushes to help achieve this look. If you know me...well...you know research in general is my forte. I never buy anything without researching the hell out of it. So I first looked into MAC and Sephora makeup brushes. And while I found their quality to be superb, their price tag is outrageous. I will admit to a point I am cheap as hell. However with all that being said I don't believe quality should always go hand in hand with breaking the bank. Nonetheless I don't also believe that buying cheap quality is also the best way to go either. I know, I am an anomaly. One day late at night while I was youtubing (of course) I came across a girl who was talking about a brand called Blank Canvas Cosmetics (BCC) which offered contouring and highlighting palette (click here if you want to read that review). However I also noticed that they had makeup brushed that looked fairly decent and were nicely priced. So I decided for the next 3 months to google the net (yes I know a bit OCD) and see what other people had to say about this brand. I noticed that they were compared many times to the famous Sigma brushes and they seemed to go neck and neck. I was debating against these and the Simga brushes. However I went with BCC simply because they had a very attractive shipping rate. BCC is stationed out in Ireland and Sigma in the USA. Nonetheless Sigma's shipping rate to Canada is outrageous because of the boxing method they use. I placed my order with BCC online for their 15 Piece Professional Brush Set without the cup or brush holders. It took less then two weeks to arrive, the packaging was simple and great and the brushes were all intact. Within this package I received 7 face brushes, 7 eye brushes and 1 lip brush (that can be used as an eyeliner brush). With shipping, taxes, the 20% discount the company was offering for January and an extra 10% discount I received from a coupon code I found; in total I paid $134.22 CDN. The original price was $165.55 CDN (without taxes or shipping). Not a bad deal if you ask me!! There really isn't enough words that I can use to say about these brushes so let start. However do note, I am not going to talk about every brush in this set, though I do love them all and highly recommend this set. Nonetheless a few of the brushes that were mentioned on the site were not the ones I received. They need to update their info and pictures in order to state what is accurately in the set. However I will talk about the ones that stand out and are worth investing in if you don't want the whole brush set. First thing I did was wash all the brushes right away according to the youtube video they had posted on their site. The brushes did have a strong smell to them (which I loved) but I still washed them right away. I let them air dry as they stated and used them the next day. The F20 Flat Buffer Brush which can be used for applying cream foundation is the most amazing brush I have used on the market to date. I normally use a Beauty Blender for applying my foundation and I never thought in life I would ever switch up or trade in my Beauty Blender. But since using this brush I have not gone back. The F20 Flat Buffer Brush gives me the most AMAZING foundation application that I have ever seen a brush do. It cuts my time in half when applying my foundation and gives me the most flawless airbrushed look that I have ever seen on my face. If you apply your foundation with any sort of tool (e.g. brush, sponge, foundation brush) then get this brush!! I can tell you right now you will not get a better flawless look with any other tool then with this brush. I plan to buy this brush again and again when its time to get a new one!!! Also, gotta love that pink handle! The F18 Short Duo Fibre Brush works amazing for blending in your concealer and/or your concealer highlighter. I love this brush. It doesn't allow my concealer to settle into the fine lines underneath my eyes, is so soft and doesn't move my concealer around or pick up to much product. This brush fits perfectly underneath my eyes and does an amazing job when blending. This brush also works wonders for blending in your contouring liquid makeup as well. The F15 Small Tapered Brush is amazing to use for powder when setting your concealer. It glides on so smoothly, doesn't pick up your concealer or foundation and due to its pointed edge fits right underneath your eyes with no problem. I use this brush in patting motions when setting my concealer with powder. I also love the fact that it has a red soft bristle head so that makes it a winner for me!! The F14 Small Contour Brush is great for highlighting on top of the cheek bones, down the edge of your nose, forehead and chin. Since its small yet has a fair amount of lovely soft bristles on the head, it fits just right in all those spaces that you want to highlight, but don't want to pick up to much powder and look overly obnoxious. The F25 Large Powder/Bronzer Brush; I am in love with this brush. This picture does not do it justice. This brush is very large, very soft, very dense and just feels like silk on your face. I use this brush to apply my setting powder all over my face. Because it has a very large head, it picks up my powder just lovely and applies it evenly on my whole face and neck. I sometimes just sit at home and glide it gently across my face to feel it soft bristles. Weird I know...but you have to try this brush to understand what I mean!! The E24 Flat Shader Brush is amazing to use to apply your eyeshadow with. It fits just right on your eyelids as if it was made molded to your eye shape. It picks up the right amount of shadow and blends it in just lovely. I always grab this brush to apply my eye makeup with. The E26 Blending Brush; my God this brush leaves me speechless. This blending brush is like a God sent to all eyeshadow wearing people. This brush blends your makeup in so well that it makes you wonder where its been all your life. I have never seen something blend my eyeshadow so well that you don't seen any harsh lines just pure perfection. I don't even know how to describe this brush, but it leave my eyes looking like silk magic if such a thing even exist. The E23 Short Pencil Brush is good for smudging your eyeshadow or placing shadow at the outer corner of your lid and inner corner of your eye. Because of its pencil head it works like precision magic in these three areas by picking up and placing the right amount of product for that certain effect that you are going for. I would highly recommend this complete 15 piece brush set. However if you are not sure you want to invest that much money right now, I would say consider these brushes that I mentioned above in order to start with. Though, makeup brushes are an expense, you want to carefully consider what you buy. Also, keep in mind this might be an investment you only really have to make once in your life. So $160.56 CDN really isn't that much if you ask me for almost a life time. I love BCC and plan on buying there F26, E39, F30, F29 and F27 brush in the next few months. I will review those as well once I get them!